Charmander in game: 27,868 Who? Important notice! Pokemon Charmander is a fictional character of humans. 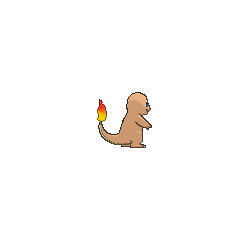 Charmander (Japanese: ???? Hitokage) is a Fire-type Pokémon introduced in Generation I. In Charmander - The Stray Pokémon, Ash, Misty, and Brock came across a Charmander which had been abandoned by its Trainer, Damian, who only cared about strong Pokémon. At first, Charmander refused to leave the spot it was at, waiting for Damian to return. However, when a rainstorm picked up, Charmander grew ill and Ash took it to a Pokémon Center. Charmander realized that Damian was no good, and joined up with Ash. It has since evolved into Charmeleon, and then Charizard. Ritchie owned a Charmander named Zippo, which debuted in A Friend In Deed. It later evolved into Charmeleon. A Charmander stars in Pokémon Mystery Dungeon: Team Go-Getters out of the Gate! as the leader of Team Go-Getters. A Charmander appeared in Summer of Discovery!, under the ownership of Trevor. It has since evolved all the way into Charizard. In Journey to the Starting Line!, Gilbert was intended to start his journey as a Pokémon Trainer, but the trio of Kanto Starter Pokémon were scared off when Ash's Tauros stampeded through Professor Oak's house. Professor Oak, Tracey, Delia and Gilbert split up in order to find the three missing Pokémon. The Charmander was the first one to be found. Another Charmander was seen with Professor Oak in A Six Pack Attack! along with a Bulbasaur and Squirtle. Another was seen in The Right Place and The Right Mime, along with another Bulbasaur and Squirtle. A Charmander appeared in The Fires of a Red-Hot Reunion! owned by the Kanto Fair Host. Seeing it inspired Ash to bring his Charizard back onto his team. A Charmander appeared in Summer of Discovery!, under the ownership of Trevor. Multiple Charmander also appeared in Battle Aboard the St. Anne. A Charmander was seen in a Pokémon Center in Hypno's Naptime. 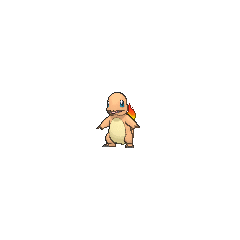 A Charmander also appeared in Pokémon Fashion Flash. Two Charmander appeared in The Breeding Center Secret. One was seen evolving on TV for a commercial about Cassidy's and Butch's breeding center, while the other one appeared in the said center. A Charmander appeared in A Better Pill to Swallow as a fantasized Pokémon. A Charmander was used by one of the students of the Pokémon Trainer's School in Gonna Rule The School!. A Charmander appeared in Alexa's magazine in The Journalist from Another Region!. 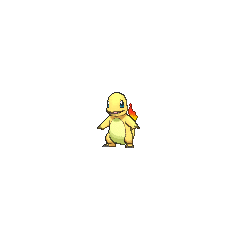 A Charmander appeared in SM003, as a silhouette. A Charmander appeared in the opening sequence for The Adventure. 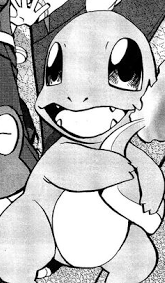 Charmander debuted in the first round of the Red, Green & Blue chapter, A Glimpse of the Glow, where one appeared in a fantasy explanation of Red and as one of Blue's first Pokémon, received from his grandfather Professor Oak. He has since evolved into Charmeleon before facing Brock of Pewter City, and then to Charizard before the Silph Co. battles against Team Rocket. The major powerhouse of his team with his newly learned Blast Burn attack, his battle skills (able to defeat Red's Poliwhirl easily even before evolving) are complimented by his fast flight, for which he was traded to Red twice, during both the Gold, Silver & Crystal chapter and the FireRed & LeafGreen chapter. It is worth noting that, as Charmeleon, he was accidentally traded to Red many years earlier. 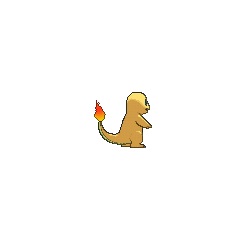 Another Charmander appeared as a silhouette when Green explains about Mew in The Jynx Jinx. After X's Marisso lost to him in a battle X decided to take him and named him Salamè in Chespin Sows the Seeds of Change. He later evolved into a Charmeleon alongside Marisso who evolved into a Quilladin in Quilladin Stands. Charmander appears in Super Smash Bros. Brawl as a trophy. Charmander appears to be predominantly reptilian in origin, and may have been partially inspired by the mythical salamander (as opposed to the real-world amphibian of the same name which inspired its mythical counterpart). This salamander was a fire-spirit capable of surviving in extreme heat or flames, and it is sometimes creatively rendered or interpreted in the shape of a lizard. Physically, Charmander has a slender body, a short nose, and a long tail, as well as other lizard-like characteristics. 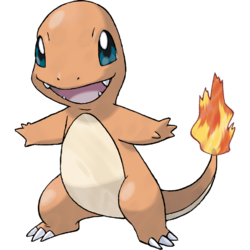 The fact that it does not undergo a metamorphosis stage (beyond its own evolutionary pattern) but instead grows into a larger version of itself as it matures, among other things, indicate that Charmander has more in common with reptiles (such as lizards) than with amphibians (such as real-world salamanders). Charmander's Hidden Ability, Solar Power, may have drawn inspiration from the spotted salamander. In July and August 2010, this species was identified as the first known photosynthetic vertebrate animal, capable of converting energy from sunlight. Charmander is a portmanteau of the words char (to burn) and salamander. Hitokage comes from ??? (salamander): ? hi (fire) and ?? tokage (lizard).